Made a few changes to The Food Charlatan’s recipe to make it more simple & with cleaner ingredients! I was surprised at how flavorful this pasta was & how much I enjoyed it! In a large pot, bring water to a boil & cook broccoli until tender. In another pot, bring water to a boil & cook the pasta until tender. 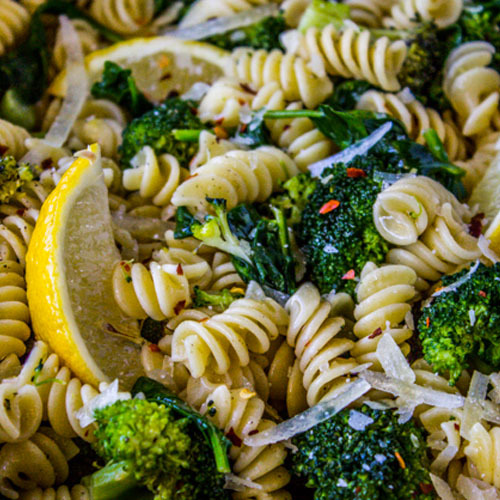 Drain broccoli and pasta once tender. While you’re waiting, saute butter, garlic & crushed red pepper for about one minute. Stir in spinach until slightly wilted. Turn off the heat and add 2-3 tablespoons fresh lemon juice. Add the lemon butter to the pasta and stir. Stir in fresh raw cheddar. Add a drizzle of olive oil and season with salt and pepper to taste. Eat hot!